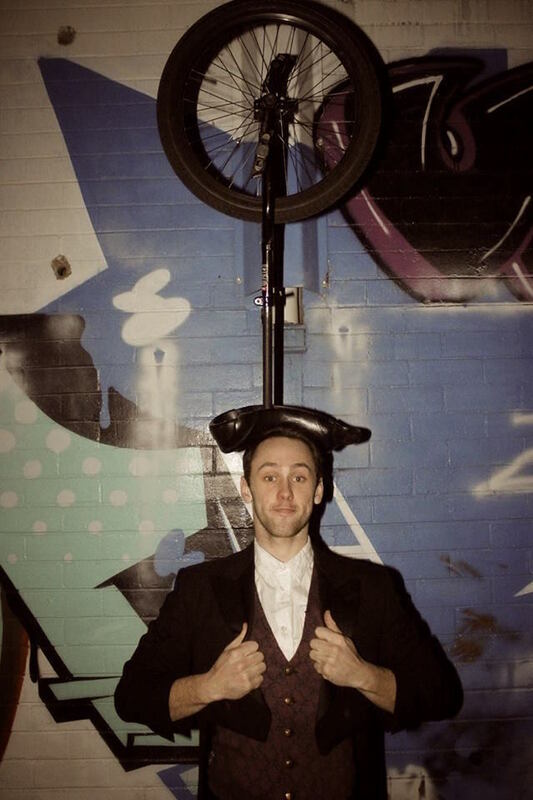 With skilful equilibrium and an off kilter tick, Riley explores his explosive relationship with his unicycle – A juggling, flipping, spiralling frenzy of movement that comes to light on a single, impractical wheel. With a mind for bizarre creation and a body for acrobatic endeavors, it is no surprise that Riley became infatuated with the circus arts. Enrolled in his local circus troupe at age eleven by his mother who suspected clowning would be right up his alley, he soon became obsessed. He found comfort in the likes of theatre, visual arts and literature where he would spend most of his time when circus wasn’t an option. Riley makes up one quarter of Four Or More Circus who have performed their children’s show ‘Out of this World’ throughout Victoria and South Australia to sold out audiences. These days you can find him swinging from the ceiling at the National Institute of Circus Arts where he specialises in swinging and static trapeze, unicycle and group acrobatics.